In what phase of meiosis does the reduction division occur? Meiosis involves two consecutive cell division; thus it is divided in meiosis I and meiosis II. Meiosis I is reduction division . Meiosis takes place in diploid germ cells for the formation of haploid gametes. Thus the chromosome number must come down to half in each gamete. In meiosis I, homologous chromosomes of a single cell separate to achieve the desired result. Each resulting daughter cell receives one genomic set of chromosomes. In meiosis II, the chromatid separation takes place. 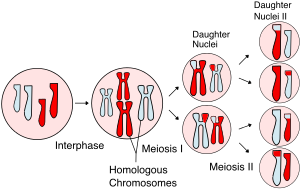 As a result, four haploid daughter cells are produced at the end of meiosis.